0n the first day of school, Jessica drops one penny into a jar. The next day Evan adds his penny to the jar. When the kids in Mrs. Madoff's class count 10 pennies, they know they've been going to school for 10 days. That day, Sam brings 10 balloons to class. On Day 20, Evan shares 20 matchbox cars. For Day 30, Michiko collects 30 colorful leaves. 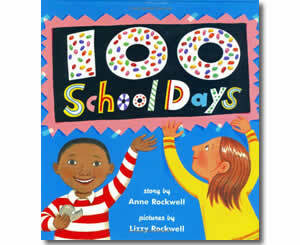 How will Mrs. Madoff's class celebrate the 100th day of school? And what will the students do with their 100 pennies? Count to 100 with Mrs. Madoff in the classroom Kirkus Reviews called "a charmed place."